I spoke to the person who did it on twitter, he mentioned both Windows/Linux were done in borderless fullscreen mode. The Linux Nvidia driver was 367.17, while Windows used 368.25. As for AMD Windows used 16.5.3, while Ubuntu used amdgpu-pro. I said before plenty of times that Vulkan will not be some magical bullet to bring Linux performance up on par with Windows. There can be problems elsewhere contributing to the performance drop on Linux. It could be X11, it could be a compositor issue, it could be lots of things. I'm certainly no expert in these issues, but seeing Vulkan perform worse than OpenGL at 4K on Linux was quite disappointing to me. At least in lower resolutions Vulkan was performing better than OpenGL on Linux. The major issue is just how much faster Windows is with Vulkan than Linux. What are your thoughts, any theories? Quote What are your thoughts, any theories? Vulkan is a new API. So far all performance tests yielded similar results. This was expected and is not news. Please don't sensationalize the issue. Vulkan will get better in time as will it's implementation by game developers. Considering how new Vulkan drivers are - is that exactly issue? Also it is quite possible that Linux Vulkan port still have strange issues left over from OpenGL. That's really say close to zero about what causes this. Also I never considered Vulkan a silver bullet. It is flexible enough to tweak engines to get acceptable performance on Linux. And did he perform the test with the Beta Steam client. This would effect the AMD results at the very least, because of the Overlay performance bug. Otherwise, what I would say is that Vulkan isn't the finished article, but it is disappointing to see this effect right now. Quote Maybe the Linux driver is still not perfect for the 1080 card? The NVIDIA 367.18 Linux driver doesn't explicitly mention any Pascal support for the new GTX 1070 and GTX 1080, but I believe that's in there too. The next driver release though should officially mention this new graphics card support. So that suggests to me that the tested driver (not sure of the Linux version he used, I assume the latest stable) is not great for the 1080. Liam, you have Windows and you can test the renderer yourself. 980Ti should be supported very well and this concern would be struck out. Some profiling to know where the hotspots are would have been interesting. No one is sensationalising anything. These are the facts. 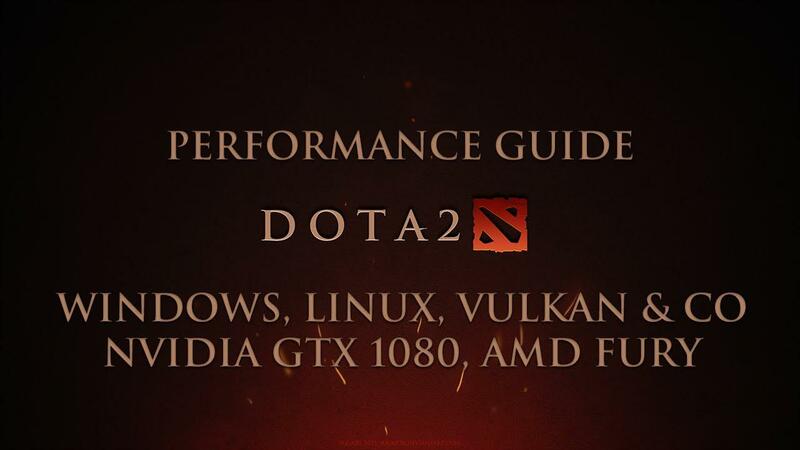 I don't see the point, since I have a 980ti, not the 1080 that was tested. Totally different generation. Did he used performance cpu governor on Ubuntu? Its been said to make huge differences sometimes. I'm actually more surprised Nvidia's Linux drivers already suppirt their 1080 card. So this is strange. i have a GTX 770 and a i7 4770k and i am running the manjaro distro with cinnamon desktop at 1080p with 364.19 drivers. I dint try to replicate the roshan scene but on average i get around 115 fps with vulkan. I usually play with vsync and i never get bellow 60 fps. the strange part here is that the GTX 1080 is more than twice as powerful as my 770, yet the difference isn't all that big as it should considering the difference in the performance of both cards.